Score, India 58-3 (2nd inns, need 406 more runs to win), Ajinkya Rahane 10*, KL Rahul 46*; James Anderson 2/23, Stuart Broad 1/17. London: India lost three quick wickets in their run-chase of 464 as Day four of the fifth Test belonged to England. At stumps on Monday, India were 58-3, needing another 406 runs to win. KL Rahul is batting on 46 runs, whereas Ajinkya Rahane is unbeaten on 10 runs. While the visitors lost Shikhar Dhawan (One run) and Cheteshwar Pujara within the first three overs, captain Virat Kohli was dismissed for a golden duck. While James Anderson dismissed both Shikhar Dhawan and Cheteshwar Pujara, Stuart Broad got the third wicket of Kohli. WICKET! This is a BIG moment in the game as Stuart Broad sees off Virat Kohli for a golden duck. Will it be England all the way from here? WICKET! Cheteshwar Pujara departs for a duck as James Anderson strikes once again to put India in trouble. WICKET! James Anderson strikes as he traps Shikhar Dhawan lbw for just one run. England declared at 423-8 following the dismissal of Sam Curran for 21 runs. India’s target will be 464 runs when they come out to bat. Hanuma Vihari and Ravindra Jadeja finished with three wickets, whereas Mohammed Shami got two wickets. Alastair Cook played a knock of 147 runs in his final innings for England as the hosts began to crumble against India in their second innings of the fifth Test after the 33-year-old departed. He, however, put up a 259-run stand with Joe Root, who scored 125 runs. Tea on Day 4 of the 5th Test. England 332 & 364/6, lead India 292 by 404 runs. However, since then England’s plans went wrong as they went down from 321-3 to 364-6 following the dismissals of Jonny Bairstow (18 runs) and Jos Buttler ( 0 runs) apart from Cook and Root. Joe Root’s men now have a lead of 404 runs. Hanuma Vihari got his first couple of wickets in Tests for India, whereas Mohammed Shami and Ravindra Jadeja also got two wickets. Ben Stokes (13 runs) and Sam Curran (7 runs) are currently at the crease. WICKET! Jonny Bairstow is dismissed for a duck by Ravindra Jadeja as Mohammed Shami takes a catch. WICKET! Jonny Bairstow is clean bowqled by Mohammed Shami for 18 runs as India are right back in the game. WICKET! It's all over for Alastair Cook as he is dismissed for 147 runs in his final innings for England. Wicketkeeper Rishab Pant takes a fine catch to see off Cook. WICKET! Hanuma Vihari gets his first Test wicket as an Indian player as he dismissed captain Joe Root for 125 runs. CENTURY! Joe Root plays a captain's knock as he gets to his 14th Test hundred. England are dominating this Test match. Alastair Cook’s farewell turned into a memorable one as he got to his 33rd Test century with England in a commanding position in the fifth Test against India. At lunch on Day four, England were 243-2, leading by 283 runs. That's Lunch on Day 4 of the 5th Test. Joe Root is batting on 91 runs at the other end. So far, only Mohammed Shami and Ravindra Jadeja have got wickets for India. CENTURY! What a farewell it has been for Alastair Cook as he slams his 33rd Test ton. FIFTY! Alastair Cook brings up his 58th Test half-century in his last-ever innings for England. All eyes will be on Alastair Cook as England look set to build up on their lead on Day four of the fifth Test against India at The Oval here on Monday. At stumps on Day three, England were 114-2, leading by 154 runs. Cook is batting on 46, whereas captain Joe Root is unbeaten on 29 runs. 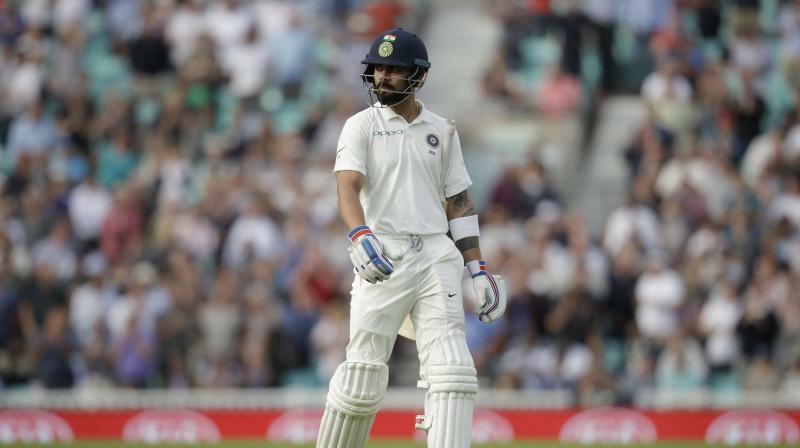 It was another mixed day for Virat Kohli’s men as debutant Hanuma Vihari (56 runs) and Ravindra Jadeja (86 runs) scored half-centuries whereas Kohli (49 runs) missed out on a fifty as India were bowled out for 292, giving the hosts a 40-run lead. The match is scheduled to start at 3.30 P.M. IST. The live streaming of the match will be available on Sony Liv app. The live telecast of the match will be available on Sony Six, Sony Six HD, Sony Ten 3 and Sony Ten 3HD.